With just a few weeks before the U.S release of Baby Comes Home on Ba Da Bing! the widely read Almost Cool blog has given the album an excellent review and tipped Patrick to follow the success by label mate Zach Condon of Beirut. "For the second year in a row, it seems that the small Ba Da Bing! Records has a big time winner on its hands. 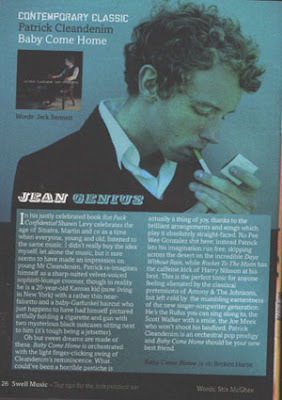 Last year, the rough, but charming debut album from Beirut (Gulag Orkestar) showed off a budding young talent in Zach Condon, and I'm going to officially be one of many to proclaim Mr. Patrick Cleandenim (not sure if that's his real name) one of the young shining stars of 2007. After playing with local bands in Kansas, he found himself in New York city attending the Cooper Union for the Advancement of Science and Arts. Like the album title states, though, he came home, and spent the wee hours of the day recording his debut album with the help of some friends and the goodwill of some college music students. For starters, Baby Comes Home sounds big. It has a wide range of influences, most of them coming before the year 1970. You can hear a little bit of early Scott Walker, a bit of British Invasion, some doo-wop, and big band orchestral pop. It's ambitious as heck, and yet it rarely stumbles, keeping a brisk pace that finds eleven tracks clocking in at just under forty minutes. The album-titled "Baby Comes Home" starts the release with just the right amount of swagger as piano and horns play off one another nicely as crisp drums keep things moving. Cleandenim's vocals are suitably crooner, and by the time the string flourishes and looser ending hit, it's easy to get sucked in. "Hypnotized" follows, and picks up the pace with some more sharp drumming, bursts of horns, and piano stomps. Vocals are a bit sharper on the track as well, moving from the loose style of the first track into a snappier observer, and the jubilant instrumentation (which is layered with everything from hand-claps and vibes) is again lush and hyper-melodic. Essentially, the rest of the album works this sort of retro cool vibe, but keeps things interesting by mixing up the instrumentation and feel of the songs nicely. "Days Without Rain" is a perfect example, with the ubiquitous piano and drums backed by dreamy swoops of strings and backing vocals that turn it into an almost lounge track that absolutely sparkles. While there are a few tracks that feel more like glorified homages, most of Baby Comes Home is not only nicely informed of the past, but has enough slight updates to make it stand out. The rough-edged "Whispers Only Hurt Them" is a perfect example, with a dual piano / Rhodes and slightly distorted vocals that slightly fray the edges of the otherwise smooth song. This is one of those rare debut releases that's very assured, and while it has a few very minor missteps, it's also an enjoyable blast. Who knows where he'll go from here, but this is one heck of a great start." 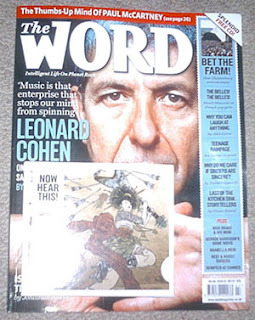 Patrick Cleandenim's Until You Said I'm Gone is featured on the CD accompanying the July issue of The Word alongside the likes of Mavis Staples, The Aliens, Nick Lowe, Suzanne Vega and Meg Baird. Beachwood Sparks Midsummer's Daydream (Sub Pop) 7"
Nick Cave & The Bad Seeds Straight To You (Mute) 7"